‘Fighting Traffic’ is a kind of social history of the street. It covers the time from around the turn of the century through to the 1930s – three decades in which the automobile went from unwelcome intruder into a mixed streetscape of pedestrians, children, hawkers, market sellers, horses and trams to dominate its every aspect – overturning literally thousands of years of tradition and custom. It is an extraordinary story. How, in such a short space of time, did motordom impose such a hegemony on street use, pushing out all other road users and claiming the space as their exclusive right? 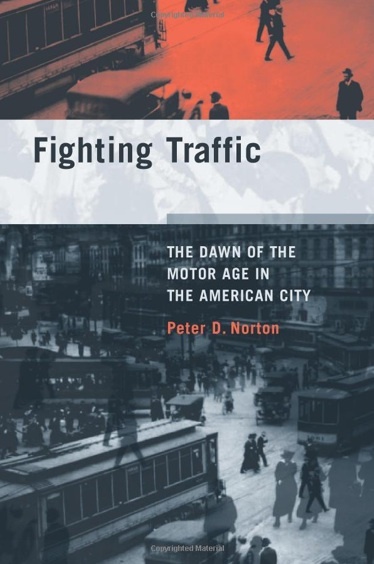 Norton’s book documents exactly how this was achieved; the re-framing of safety issues to remove the blame for pedestrian deaths from motorists, the rise of the professional road engineer for whom success was measured by the faster flow of automobiles, the lobbying and political manoeuvres that enmeshed the motor agenda into both state and federal policies. A co-ordinated and polished attack on the status quo that not only forced others from the road (in both the figurative and literal sense) but also quickly became accepted as the norm. Not every step was perfect, and the motor lobby made mistakes along the way, but it is extraordinary how in such a short space of time American cities went from erecting large monuments in memorial to those killed by motor vehicles, unveiled to passionate speeches about the dangers of the motor car and their reckless drivers to welcoming more and more cars on ever larger and wider roads whilst other road users were pushed to the very margins, demoted to second class citizens and even blamed as the cause of the road toll whilst the motorist sped past obliviously. It is a paradigm that we still live with today. Reading this book is a reminder that the current state of affairs, far from being the norm, is a recent invention. For most of human history, the street has been a shared place, a common resource for all to use. And if we wish to return to something more similar to this, then it is instructive to understand how we got to where we are today. There is more I intend to write on this topic, as I think there are lessons in this history for us all, and certainly for cycling advocacy. Notwithstanding the extraordinary story and the impeccable research, though, I have to say this is not an easy book to read. It is very dry, very academic, and written as lots of short essays and episodes. This means it lacks narrative flow, is often repetitive and frankly rather dull to read. This is a real pity. There is an extraordinary story in here, one that needs to be told. Just think what an author such as Wendy Moore or Adrian Tinniswood could do with this material, to bring it to life and arrange it for a more casual reader! 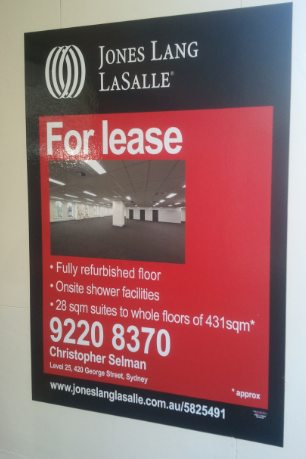 Riding over the Harbour Bridge the other morning on the way to work, I noticed something new on the North Sydney side. A rather splendid bicycle pump has bee installed. It seems to work quite fine, so anyone riding that route who feels the need to put a bit more air in their tyres can now do so easily. 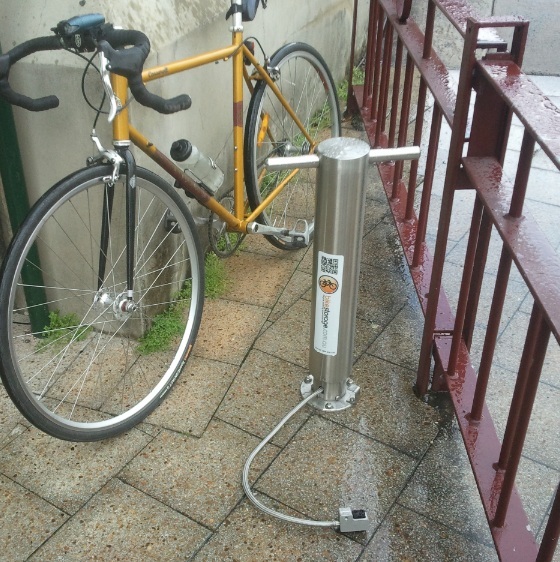 I suppose some applause for North Sydney Council is appropriate here, although rather muted applause give that they remain resolutely anti-cycling, have a miniscule cycling budget (I suspect this pump represents most of it!) and are more well known for infrastructure disasters like this. Still, new facilities for cyclists are welcome. 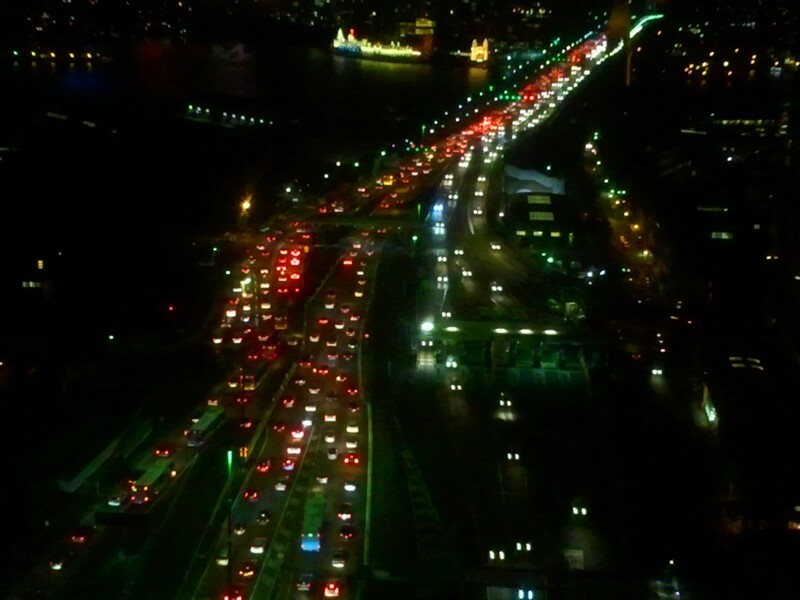 Clearly there are no new facilities for motorists using the Harbour Bridge, as it remains as congested as ever- this is how it looks on an average workday evening. The reason why there’s no fancy blurring of the car tail lights in the pic isn’t the lack of long exposure; more to do with the fact that most of the cars are stationary. People apparently do like sitting in the cars, even though the weather over the past few weeks in Sydney has been sensational – bright and cool. Well, my beloved fixie has emerged from rocket surgery and is back on the road, after all the issues I had with the forks, and then various delays getting it sorted. Thanks to the nice people at Salsa and Dirtworks I have a shiny new set of forks; after hearing my tale of woe they came through and replaced them for free, even though they were out of warranty. Thanks guys, really appreciate it! The front rim was almost worn through and the front hub bearings were also shot beyond repair. 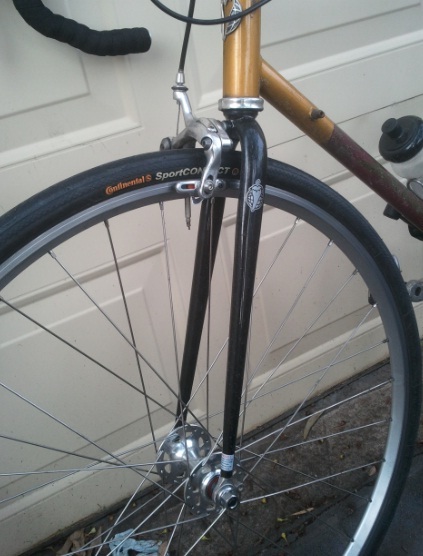 So in the end I got a completely new front wheel too. This means the whole front of the bike has now been replaced – and it’s especially obvious as replacement forks were only available in black. I suspect this means anyone looking at my bike will probably tut tut to themselves and mutter ‘must have had a stack and trashed the front of his bike’. Still, I can live with that, as it’s great to be back in the saddle. I went the long way round to get to work the other morning, to have a bit more of a ride, and all was well – just so much fun blasting up the hills (as opposed to crawling up on the Radish!). Hurrah, I love my fixie. Ride and Smile, everyone!!! Regular readers may have noticed that the biscuit reviews have been a bit few and far between lately. Whilst that’s partly just because I’ve not got myself into gear to write them, there is also another, more pressing reason. You see I’m simply running out of varieties. Notwithstanding the apparently near-infinite range Arnott’s seem to have, I am now finding it very hard to find new and interesting sweet treats to sample. So imagine my joy, dear reader, when I happened down the biscuit aisle in the supermarket one lunchtime, and saw a bone-fide brand new Arnott’s line! I rushed them to the checkout (unexpected item in the bagging area indeed! ), and from there back to work in order to tear into them. 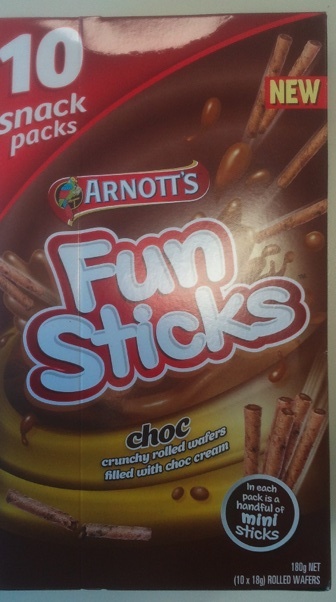 Fun Sticks seem to be part of a new range designed as lunchbox fillers.There are two other lines in the new range, although the other two are simply re-packaged Tim Tam Originals and Mini Wagon Wheels (although I might have to try the Tim Tam ones, to see if they are a new form factor, or just new packaging). At first glance, Fun Sticks seem to be a miniature version of those praline things you get in large tins at airports – and indeed this is sort of what they are like. However, what I wasn’t quite expecting was just how miniature they were going to be – about five centimetres long and perhaps only five millimetres thick. 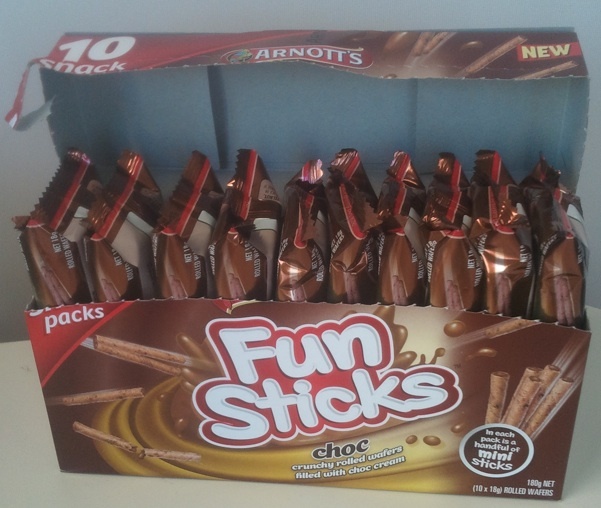 There are ten ‘snack packs’ in the big box, and each ‘snack pack’ contains nine Fun Sticks, thoughtfully placed in a plastic tray. So that’s a full ninety sticks of fun to chomp through – something that, given their size, I would say was eminently achievable in a single sitting, for the truly dedicated. 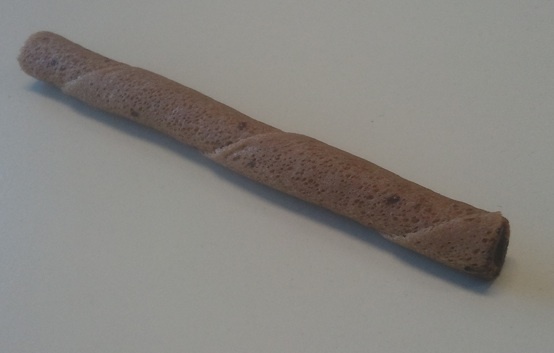 The other striking thing about Fun Sticks is that they look exactly like small cigars. Indeed, as I raised one to my lips to sample it’s choc stick goodness the guy who sits opposite me looked up in surprise and said ‘Is that a cigar?’. Once he said this, I found it impossible to resist the temptation to take some imaginary puffs and do a quick Groucho Marx impression. I wonder if kids these days still do this kind of thing, now that you can no longer buy candy cigarettes? Once I got thinking along these lines, I also couldn’t help noticing how the main packet also seemed to have something of the appearance of a box of smokes, and the little tray in the individual packs does make handing them around feel a lot of proffering cancer sticks. All very strange – I wonder if this line was dreamed up down in the smokers corner of Arnott’s factory? Still, for all that, they taste quite OK; soft choc cream inside a light, crispy tube. Sure, it’s cocoa rather than real chocolate but as an everyday snack I suppose it does the job – they are quite moreish and I would say the elements of the size, shape and packaging does add a definite element of fun. I’m going to give them seven out of ten. I happened to be wandering around Circular Quay the other day, and the exhibits for the ‘Vivid’ festival were all set out. 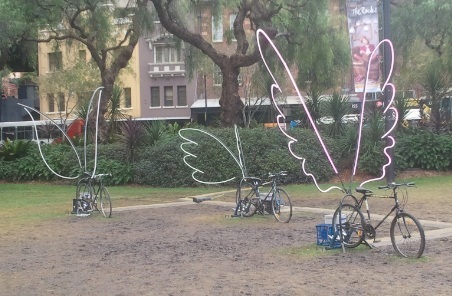 One that caught my eye was an installation of bikes, each fitted with fairy wings that illuminated when the bicycle was pedalled. All rather splendid, although I thought it was a great pity that the lights were mains powered; they illuminated when a sensor detected the wheel was turning but the whole thing was plugged into an electricity supply. how much better would it have been if the lights were pedal powered? Still, they looked very cool, and it was a pity that I never managed to get down when it was dark to see them in all their glory. The tradition of cold weather and heavy rain on the Queens’ birthday long weekend was duly observed at the weekend, with it really lashing down on Monday. Its also the weekend of the Darling Harbour Jazz Festival, and the organisers of that event must shake their heads in disbelief as – yet again – the rain pours and the wind whistles. They should give up and hold it in the summer. 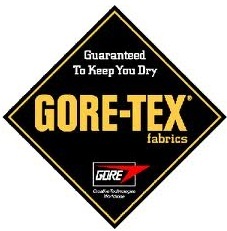 It didn’t stop me from going out though; I had to go to the shops so I swaddled myself with head to toe Gore-tex and set off into the storm to buy fish for supper. I didn’t see any other cyclists, although there were a few hardy souls jogging around the bay, looking very wet. I cruised along on the Radish having a fine old time, the rain drumming on my hood and the water swishing under my mudguards. I got several admiring comments about the Radish too. It does seem to intrigue people.